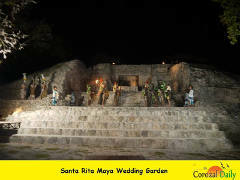 The Chactemal/Santa Rita site is becoming a popular site for weddings and wedding re-enactments, remembering the wedding here or nearby in the very early 16th century between the Spaniard Gonzalo Guerero and the Maya princess Zazil Há, the first wedding of a native American and a European on the continental Americas. This signifies the birth of the Mestizaje or Mestizos (meaning mixed). 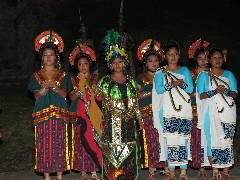 They are the ancestors of most native Belizeans. 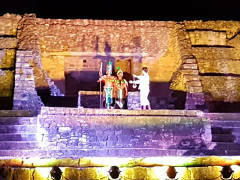 As part of the Corozal Coconut Festival 2019, there was a sixth Maya Wedding Re-enactment, a Pok-ta-Pok demonstration, and other information presented on 29 March 2019 at the Chactemal (Santa Rita) Archaeological Site. The fifth Maya Wedding Re-enactment, on 19 May 2018, included an actual Maya Wedding, this time between Samuel Hall and Yiezell Rodriguez. 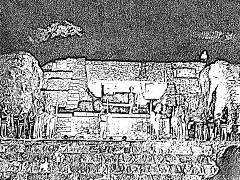 This was part of the excellent Maya Symposium presented by the To’one Masehualo’on, and the Northern Maya Association of Belize. There was no restriction on photos, and thanks again to the Ballet Folklórico de Quintana Roo (Chetumal), it was the best yet. 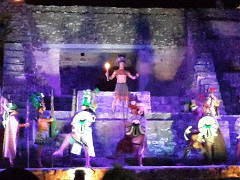 There was another (the fourth) Maya Wedding Re-enactment on 6 July 2017. Again there was a restriction on cameras and video equipment. We have a few cell phone photos, that may or may not be authorized. See the this page. 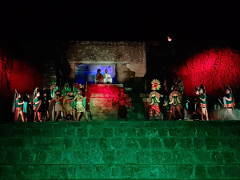 There was a third Maya Wedding Re-enactment on 5 February 2015. We have cell phone photos from that excellent presentation, that at least give you a feel for this important commemoration. See this page. We were not allowed to take photos at the second one, on 22 March 2014. Some photos were promised but we have never seen them. We’re still hoping. In the meantime, Lincoln Eiley has given us permission to include his report from Corozal Daily. On the page after that, you can see some of the highlights from the first Festival del Mestizaje, in December 2012, where CJC students re-enacted the wedding of Zazil Há and Gonzalo Guerrero. Printed from https://chactemal.com — Chactemal Weddings.